One of the reasons I prefer SAGA and other skirmish games is that they cater to my budget and my diverse interests. Napoleonic war gamers can build a two thousand plus figure army, all meticulously based and painted, and they are focused on that army for years. For me, the appeal of SAGA is collecting 40-60 figures and researching that particular corner of the Dark Ages for a couple of months. Then I can run them in some games, and then build an opposing army. 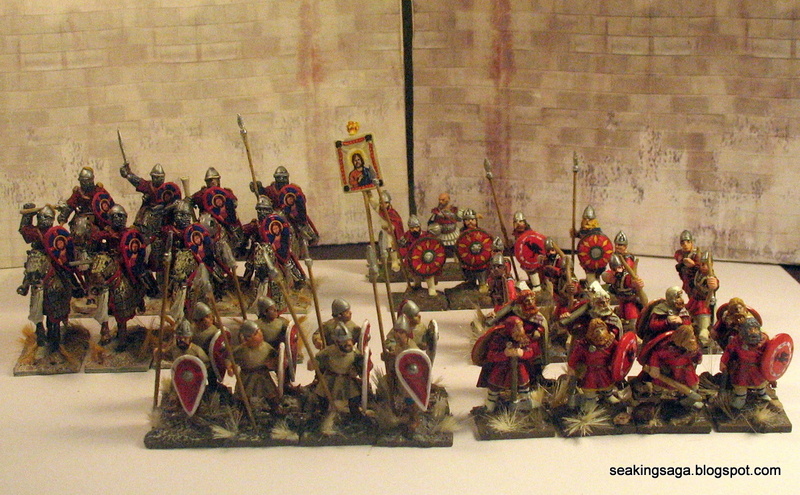 These cavalry bring my Byzantine army to a completion. The Byzantines of the tenth and eleventh century fielded a far heavier cavalry than contemporary armies in Western Europe. Byzantine warhorses were protected by quilted or scale armor, and the heaviest kataphractoi wore lamellar and scale armor beneath a quilted coat. According to Anna Comnena, her father Alexius was struck by multiple Norman spear at the Battle of Dyrrachium in 1081. The spear embedded in his armor and he cut them off, and the emperor was then able to escape his pursuers. The development of Byzantine heavy cavalry was an obvious response to the heavy cavalry found in late Roman Empire's allies and enemies. The Sarmatians and Persians deployed heavily armored cavalry well before the Romans. Also, the wealthier economies of Eastern Mediterranean states and the flatter geography made heavy cavalry a more viable option than the poorer kingdoms of the west. The eight figures below are two packs from Gripping Beast. The unit in the rear is a command unit, and the group in front are mace bearers. Part of the reforms and policies of the Emperor Nicephorus was to standardize equipment for the Byzantine army. Part of this was to insure that the cavalry carry multiple weapons; in case of breakage or loss a khataphract might carry two swords and two maces into battle. The command unit, in which the horses heads are covered by an iron plate instead of scale. ...but I still want one. The Alexiad by Ana Comnena. The Byzantine princess' account of her father's reign is praised for its forward looking approach to historical methodology. That said, she worked to portray Alexius in the best possible light, especially in the aforementioned battle of Dyrrachium, a devastating loss for the Byzantines. Your band looks inpressive all together, really like the cavalry!